Could it be Thunderbird 7? Well no, but it sure does look like Brains consulted on it’s design. It’s the Focus 21 from France and it can not only sail the seven seas, it can fly over them as well. 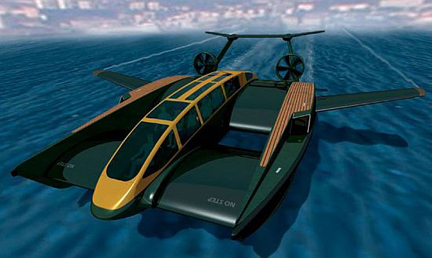 The Yacht’s design is one of a giant wing with engines – a flying wing for the water. It has a range of approximate 100 km in this configuration and can carry up to 15 passengers. It’s not the first time this idea has been tried. The Russians created the Ekranoplan (or sea skimmer), and it had the advantage of being able to carry tremendous amounts of cargo – over 100 tons as it skimmed a few meters off the surface at a top speed of nearly 500 miles an hour. That’s the beauty of Ground Effect. Next stop, Tracy Island. F.A.B.! 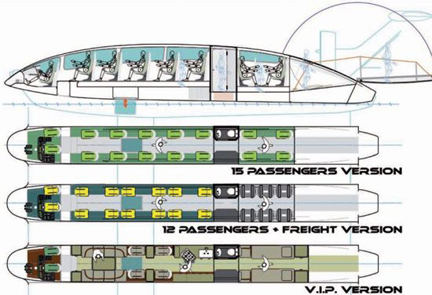 I want one too , nice for housing into larger std Yacht & then pop this out from the mother Yacht, Neat Nice for 007. Tug, Survey, C3I post, & Ideal mated to a nuclear sub & launched from below the surface @ 40 ft depth with Cargo etc from sub to shore for Navy SEALs & Royal Marines SBS Units. Ideal to Rent the 5 passenger model. Rentals for HI, Caribbean, Med Sea, Red Sea, Indian Ocean, Australia. How much does it cost for the Superyacht looks like it belongs to International Rescue. I need to find out! !